Over the past few years the Dragon Boat Ergometer (DBE) developed by Grayson Bourne’s company KayakPro, has become the Ergo of choice for many paddlers and Dragon Boat Clubs around the world, as paddlers look for other ways to train during the winter months, other than breaking the ice and paddling their dragon boats or 01s on the water. The IDBF is giving every paddler the opportunity to become the ‘1st Ergo World Champion’ in their chosen Racing Class and all you need is access to a KayakPro Dragon Boat Ergometer, chosen by the IDBF because it has a proven soft wear programme specifically designed for Dragon Boaters to train with and keep fit. SO HOW WILL THE COMPETITION BE STAGED AND HOW WILL IT WORK ? During the period 1 Feb to 31 Oct 2013, you just have to set a time on an KP Ergo by following the IDBF KayakPro Ergo Rules detailed below and then register your time here on this page. KayakPro will maintain the record of times and much like a ‘Squash Ladder’ the object will be to end up as one of the Top Ten times in your Racing Class on 31 October 2013. After that, the top 10 in each class will be required to validate their times by competing against each other by recording their ‘Grand Final’ time, with KayakPro during November 2013. There is just one extra ‘Golden Rule’ for the Grand Finals and that is that all times have to be validated by an IDBF Adjudicator who must be present when the Grand Final race time is undertaken and recorded. A list of IDBF Adjudicators in their own areas will be sent to the Grand Finalists, who must have an Adjudicator present at their Grand Final attempt and cover any expenses that the Adjudicator might have. The Adjudicator will normally be an IDBF International Race Official, a nominated Coach or other person nominated by the IDBF Competition & Technical Commission. The top three paddlers (crews in the Team Competitions) will be declared the Gold, Silver and Bronze Medal winners of the 1st IDBF KayakPro Dragon Boat Ergo World Championships – the IDBF Ergo Worlds’. The Race distance is 500m. Participants and potential qualifiers will undertake their time-trial performance in their own “home” location using their own or an available KayakPro MultiStroke Ergometer. The top 10 qualifier places at the cut-off date of 31st October 9 pm EST.- will advance to the “final”. The final will be a further independent time trial race-off in order to determine the final top 10 placings. The “final” time-trial must take place under validated conditions with a Guest / nominated arbiter present, the nomination of the arbiter will be at the discretion of the IDBF, agreed and confirmed by email prior to the “final” test being undertaken. The “Final” performance – can be at a time of choosing of the 10 x finalists but must be completed and recorded no later than 31st November 2013. Contact details - email address and contact telephone will need to be provided by the Grand Finalists at this time. Only times, performances or results recorded on the KayakPro Dragon Boat or Outrigger MultiStroke Ergometer will be eligible. Each Ergometer must be calibrated and athlete weight in Kg. Input in order to qualify. Data regarding the performance must be entered onto the scoreboard as below. The Console number on the Ergometer needs to be input in order to record all of the above data. The console number is a 5 digit alphanumeric code located on the back of the console. After calibration the Athlete is not allowed to alter the resistance lever – but is allowed to alter shaft length. The pull back-stroke on the Ergometer must not be more than 300mm past the rear seat line. This cannot be monitored during qualification- but we hope that honesty and good sportsmanship will prevail. “Final” – Top 10 performances will be subject to validation by nominated arbiters. Athletes can take and record a maximum of 5 attempts. Please note the Resistance level 1-9 or the paddle shaft length does not make a difference to the distance traveled / or time results. Remember it's fun!!! Enjoy yourself! Before using the interactive IDBF – KayakPro World Ergo Championship Scoreboard and KayakPro Ergometer. The Participating athlete must confirm that he / she accepts full responsibility for-self, in order to use and /or enter the program. By the action of entering the athlete confirms that he / she is fit for exercise. To that end is the participants responsibility to consult with their doctor or healthcare professional to ensure you they are fit enough to undertake strenuous exercise. By entering the data on the scoreboard and / or attempting a performance leading to same- the participant renders and releases KayakPro USA LLC, it’s employees, estates and personal free from responsibility and liability for any injury or occurrence as a result of using the Ergometer. The user assumes and accepts full and complete responsibility for self- and for all potential and actual injury that results from undertaking strenuous exercise or by the use of the KayakPro Ergometer. Before Racing the participant should make themselves fully familiar with Ergometer and the interactive website. The participant or user must ensure that the Ergometer is in good working order prior to use, and the responsibility for this will also lie with the user and is a condition of entry - no modifications to the Ergometer are allowed. 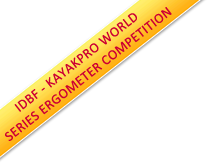 The IDBF – KayakPro World Ergo Championships- is a self monitoring, honesty based reporting table – Sure, it is possible to cheat by posting incorrect information, but we appeal to each and every users’ good sportsmanship and candor. KayakPro USA LLC and the website undertake no policing or validation of the reported results. 1. Input your accurate body weight in Kg. I've read and agree with the disclaimer.